China will debut the next in its new line of rockets as early as Saturday, also marking the grand-opening of a new civilian launch base on the Island of Hainan. 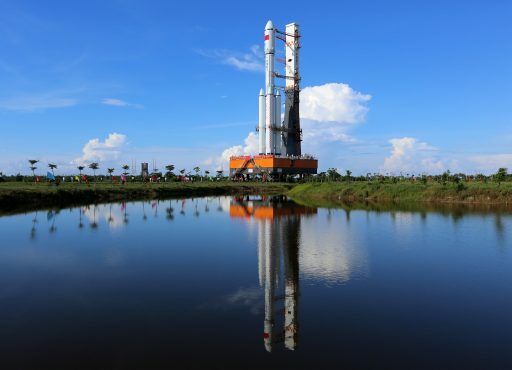 The Long March 7 rocket – China’s new medium-lift workhorse – is set for its first launch attempt at 12:00 UTC on its maiden voyage to demonstrate new rocket technology set to become China’s ride into space for the next several decades. Whether Saturday’s launch attempt will actually take place is not yet certain due to a bad weather outlook at the new launch site and a general lack of information on launch processing milestones. The official launch period extends through Wednesday, meaning that liftoff may not necessarily be aimed for the weekend. The introduction of China’s new line of rockets marks a major shift in technology and design philosophy – switching from rockets consuming an expensive and toxic hypergolic propellant mixtures to a more environmentally-friendly Kerosene-Oxygen combination that also provides an increase in performance. Also, the new rockets bet on simplification by commonality – sharing a number of components including engines across the new launcher fleet to streamline the manufacturing process and rapidly build flight heritage. 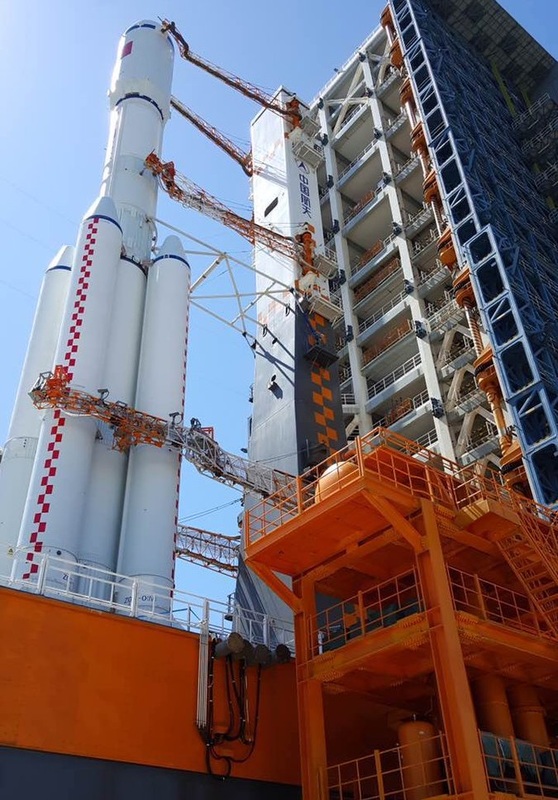 China’s first new launch vehicle debuted last year when the light-lift Long March 6 took flight – providing a first demonstration of the structural systems and engines employed by the larger vehicles that will ultimately replace China’s current vehicle fleet at some point in the 2020s. The Long March 7 variant is expected to become China’s new workhorse launcher, tasked with lifting future space station resupply vehicles into orbit and carrying satellites to Geostationary Transfer Orbit. 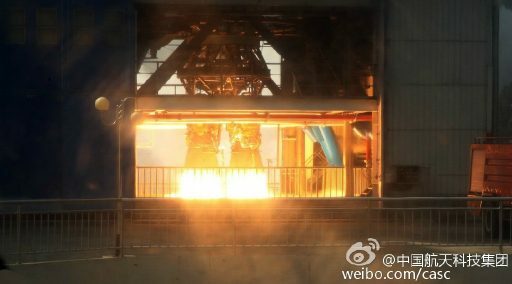 When its reliability has been fully established, CZ-7 will take over crewed missions employing China’s next generation spacecraft. 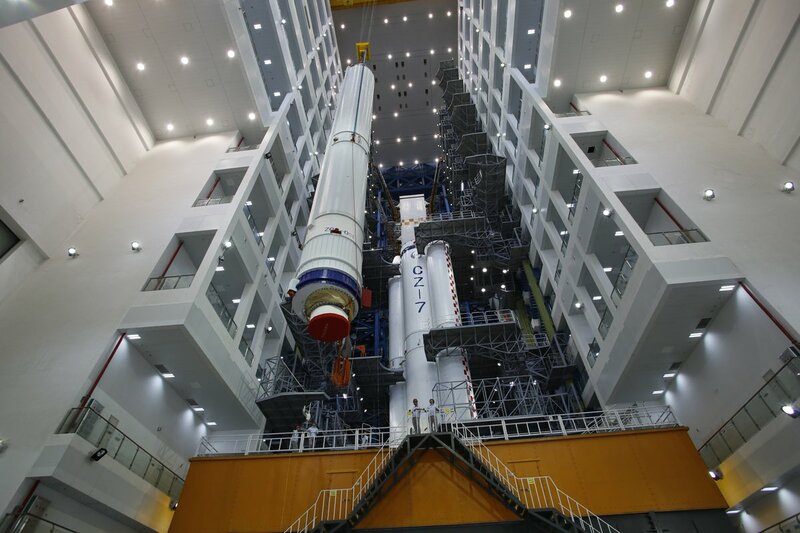 Long March 7 consists of a structure similar to the Long March 2F rocket currently in use for China’s crewed space program. The launcher stands 53 meters tall, comprised of a two-stage stack with four liquid-fueled boosters clustered around the first stage – all fueled by rocket-grade Kerosene and -183°C Liquid Oxygen. All in all, the rocket weighs 595 metric tons at liftoff and is capable of delivering 13,500 Kilograms into Low Earth Orbit and seven metric tons to Geostationary Transfer Orbit – making it China’s most powerful rocket until the heavy-lift Long March 5 makes its first flight later in the year. Until now, China’s most powerful launch vehicle was the Long March 3B – a hypergolic beast with additional cryogenic upper stage, capable of lofting 5,500kg to GTO. Each of the four boosters – 2.25 meters in diameter and 26.5 meters long – features a single YF-100, an engine based on the Russian RD-120 that was acquired by the Chinese in the late 1990s and heavily fed into the design of the 1,180-Kilonewton YF-100. The Core Stage of the CZ-7 – 26 meters long and 3.35 meters in diameter – sports a pair of YF-100s, bringing the vehicle’s liftoff thrust to 7,080kN – 722 metric ton-force. Sitting atop the core is the K3-2 second stage that shares the first stage’s diameter and is around 11.5 meters long, powered by a pack of four YF-115 staged combustion engines for a total thrust of 73,400 Kilogram-force. It is understood that CZ-7 will make its maiden voyage with an additional YZ-1 upper stage – a low-thrust hypergolic rocket stage capable of making multiple burns during flight to reach a variety of orbits. 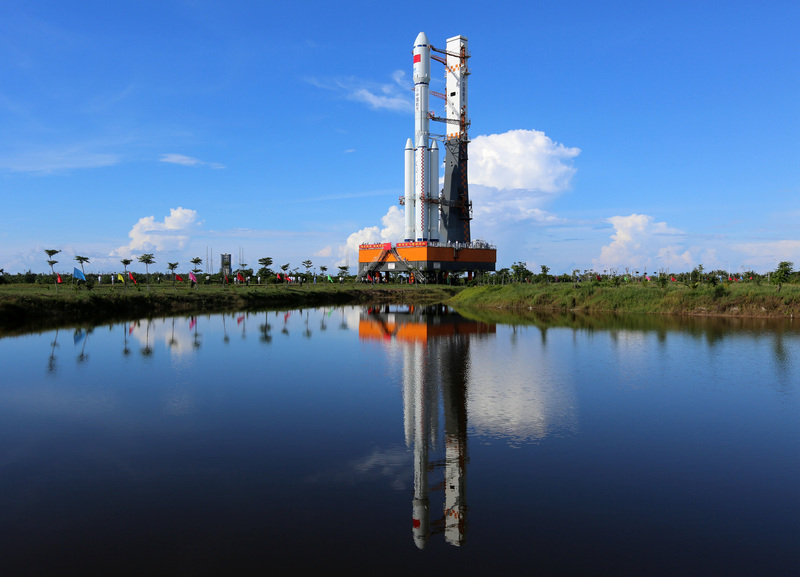 The maiden flight of Long March 7 also marks the grand-opening of the Wenchang Satellite Launch Center on the eastern tip of the island of Hainan south of China’s main land. The new facility finished construction in October 2014 and both, Long March 7 and CZ-5, performed exercises to verify the fit and functionality of ground systems at their new launch pads. Wenchang provides a number of advantages over China’s three inland launch sites Jiuquan, Taiyuan and Xhichang. It is accessible by ship, allowing rocket components to be delivered from their manufacturing plant in Tanjin by sea, lifting any restrictions on the maximum size of rocket stages for road or rail transport. Hainan’s low latitude compared to the other launch centers will increase the payload capability of the launchers and another advantage is that all used rocket stages will drop into the Ocean and no longer fall near inhabited areas in China. 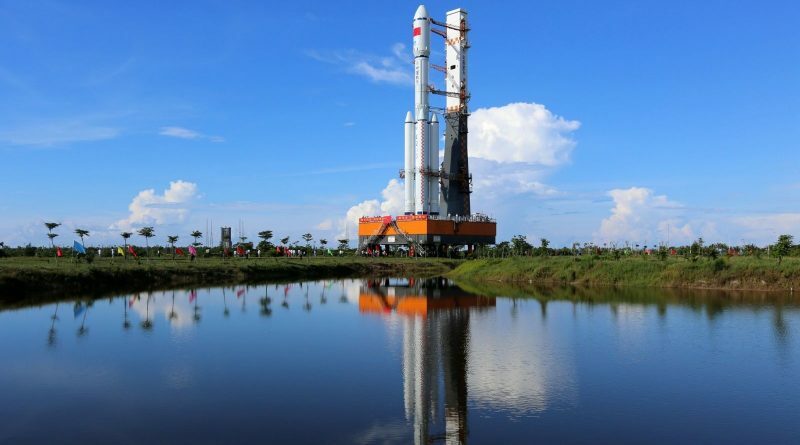 Wenchang is classed as a civilian spaceport and its launches will be open to the public. Eight designated viewing areas have been established around the Launch Center for the public to observe launches from for the first time in Chinese spaceflight history. Located just over five Kilometers from the launch pads is the five-star Hilton Wenchang, providing a first-class lodging and viewing location for visitors. 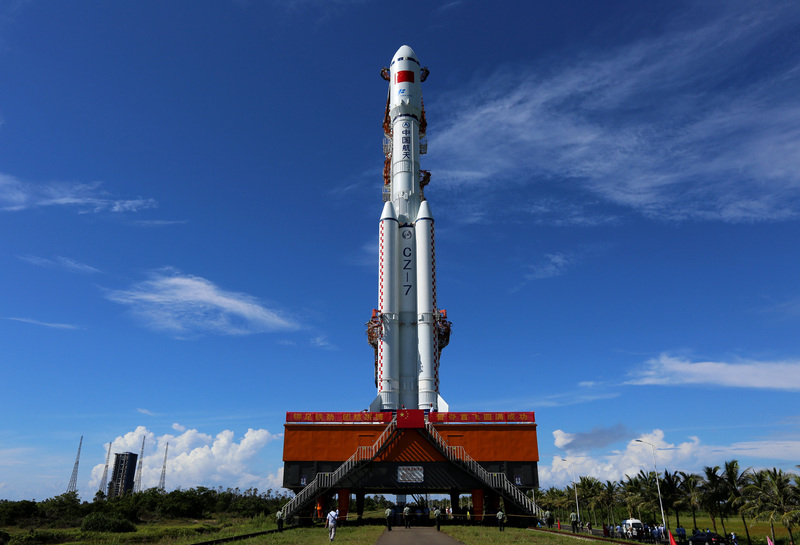 Despite the new launch center’s accessibility to the public, the flow of information on the preparation for the first Long March 7 launch has seen the usual restrictions of Chinese space activities. Little to nothing is known about the payloads hidden under the 4.2-meter fairing of the Long March 7 rocket. Reportedly aboard the vehicle is a prototype version of China’s future crewed spacecraft, a ballast mass, the Aoxiang-1 two-unit CubeSat and two other small satellites. According to reports, the prototype vehicle is outfitted with a navigation system, heat shield, parachutes and a communications system capable of transmitting through the plasma occurring during the hypersonic re-entry sequence. A possible landing zone for the capsule has been identified in air route closures showing a restriction in Inner Mongolia on June 26 between 7 and 8 UTC. 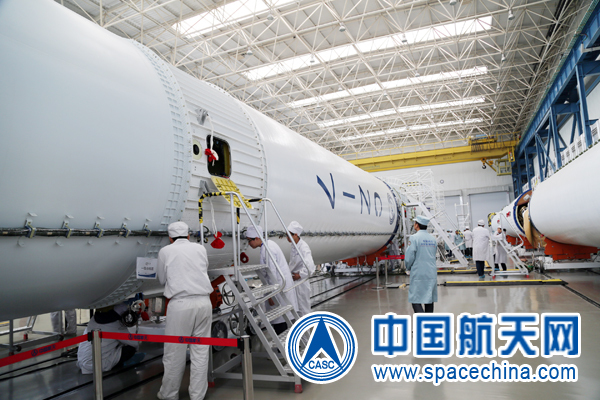 The first flight-worthy Long March 7 rocket was delivered to Wenchang in May and underwent assembly in a Vertical Assembly Building ahead of being rolled to Launch Pad 201 on Wednesday in a slow, three-hour trip. As part of a lengthy countdown, the vehicle will be loaded with nearly 550 metric tons of Kerosene and Liquid Oxygen which will be kept topped up at flight level until late in the countdown. If launch occurs at 12 UTC, Long March 7 would take flight less than one hour after sunset, rumbling uphill under the power of six YF-100 engines. Completing a short vertical ascent, the vehicle would turn to the south-east to head into what presumably is a Low Earth Parking Orbit. The three boosters will exhaust the propellant supply around the three-minute mark and separate from the rocket which will continue powered flight with the core’s two YF-100 engines for another 20 to 30 seconds with thrust on each increasing to 1,340 Kilonewtons when flying through the rarefied upper atmosphere. Assuming control of powered flight, the second stage will fire up its four YF-115 engines to head on towards orbit. 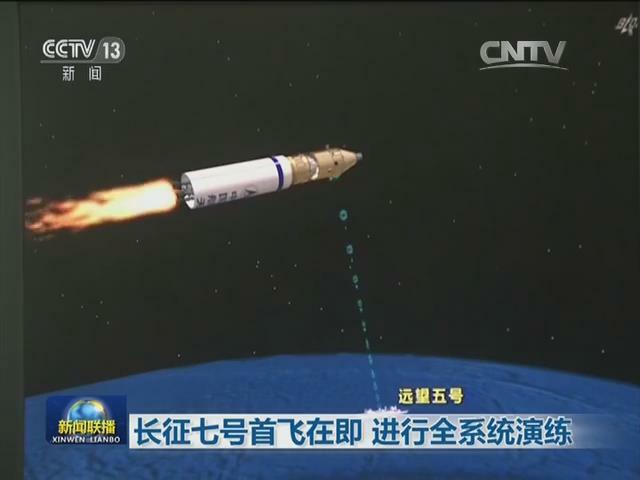 A new capability for China’s rockets is the re-start capability for second second stages, giving Long March 7 a great deal of flexibility in its ascent trajectories to reach a variety of orbits. After the second stage is done, the Yuanzheng-1 upper stage will take over with its 6.5-Kilonewton engine. According to reports, this flight will put the upper stage to the test with four planned burns, though no detailed information has been released on the target orbit for this flight. 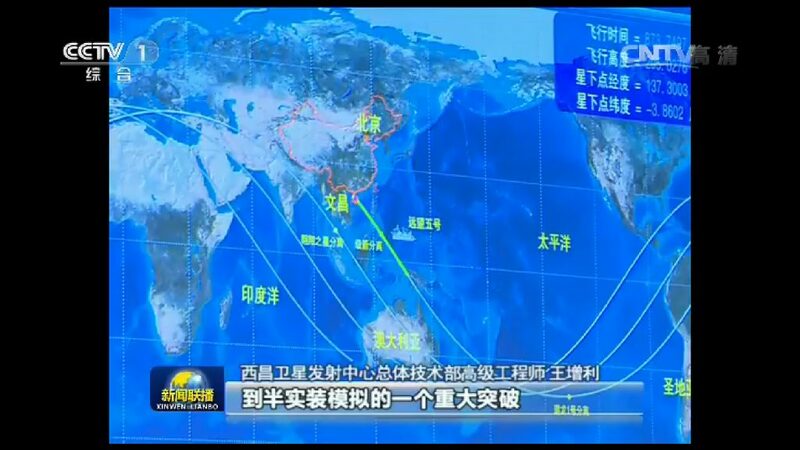 A live TV broadcast via China’s state channels is unlikely and video will likely be played after the mission is complete. Wenchang’s location and the presence of observers will likely provide some insights into the progress of the launch and amateur webcasts may be available on launch day.